Adam and I used to be committed viewers of Alton Brown’s Good Eats. We’ve since given up our cable subscription, but we still turn to this recipe as a tasty snack to occasionally indulge in. 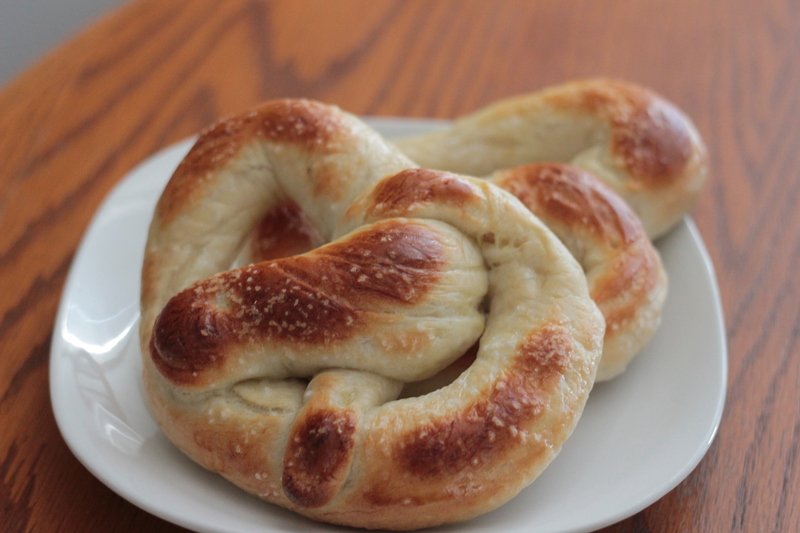 Place the pretzels into the boiling water, 1 by 1, for 30 seconds. Remove them from the water using a large flat spatula. Return to the half sheet pan, brush the top of each pretzel with the beaten egg yolk and water mixture and sprinkle with the pretzel salt. Bake until golden brown in color, approximately 12 to 14 minutes. Transfer to a cooling rack for at least 5 minutes before serving.